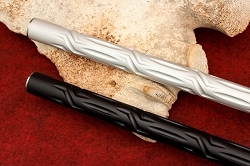 Another superb aftermarket barrel for the .22LR by Kidd Innovative Design. 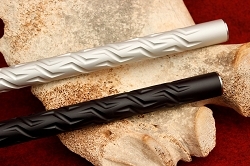 This Ultra Lightweight Fluted Bull Barrel weighs just over a pound and yet is a great shooter! We have seen a niche in our barrel market for a much lighter weight barrel and believe our customers will benefit from our durable steel barrel anchored by a stainless steel breech and stainless steel muzzle design. As with all our barrels the bore is hand lapped here at KIDD. This will be great for people who don't want to tote around a heavy rifle but still want a high quality product. 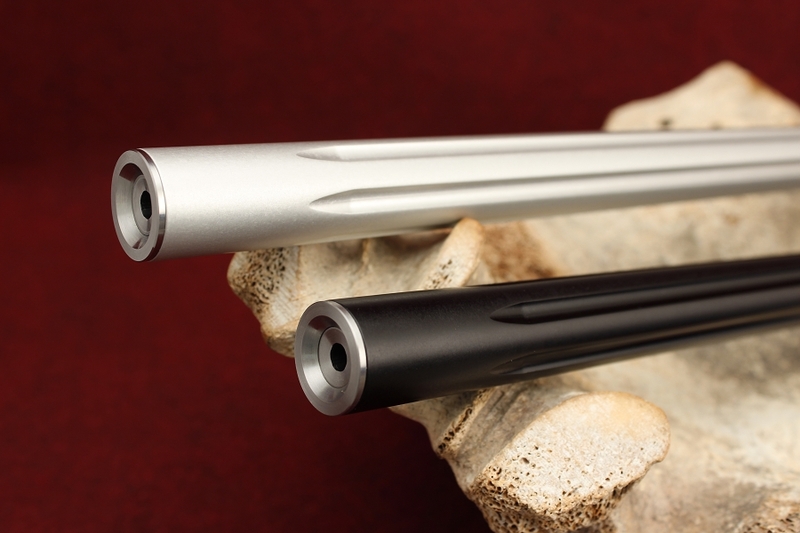 At 1.25 pounds and 16 1/4 inches in length this is our lightest rifle barrel. Our product testing has resulted in 1/2" groups at 50 yards. Though, we don't guarantee this barrel to group at that rate. A threaded muzzle is an option on the barrel and our threading is 1/2"-28 and is available with a protective cap or muzzle brake. For those customers that would like our threaded and caped version the length will increase just slightly to 16 3/4" and our ultra lightweight barrel with our aluminum muzzle brake will be 18 1/4" in overall length. This aftermarket 10/22® barrel will drop into any bull barrel channel rifle stock and will look like it was custom made for it. Beautiful fit and finish! With this barrel on my otherwise stock 10/22, I am getting sub half-inch groups at 50 yards with RWS and Eley ammunition. No exaggeration. Hands down, this is now the most accurate rimfire I've ever shot. Already wrote a review on my other black Ultralight barrel I purchased from you a little while ago and the system won't let me post another. Just wanted to say that this stainless one didn't disappoint as well. I don't know how you do it. It is ridiculously accurate for a lightweight barrel. I set up half inch paint stirrer sticks in the ground at 100yd and got every single one of them. Then I set up a bunch of 1inch dots on paper and managed to get them all. I have tried pretty much every single 10/22 barrel manufacturer at some point. Nothing compares. Tony Kidd, family and staff, may you guys be around forever. Super accurate out of the box. I built this in a lightweight platform with a Fab defense folding stock(love it), TM receiver and Kidd trigger and bolt group. I have a 3x magnifier red dot on it. It shoots every bit as good as my very accurate 77/22 with a 3x9 scope. And this is just playing around with a magnifier scope. At 40 yards rapid fire with 25 rounds of cheap ammo it shot a quarter sized ragged hole. Very nice stuff! Very pleased with this barrel. Took 10 total shots at 100 yds into a piece of cardboard with a 2'' sharpie bullseye, wind was 15mph into my face with slight cross wind. 8 shots in the bullseye and the other 2 just outside . cant wait to get a scope for it. The barrel itself is a work of art and makes my new 10/22 look beautiful. thanks to the folks at KIDD.